Things continue to fall apart for the Center of Medical Progress following their court date, as the police raided the home of company head David Daleiden, seizing hard drives and computers for evidence. The moral of the story? You can lie for Christ all you want to on TV and talk radio. Do it in a courtroom, however, and you will be looking at contempt of court, if not jail time. Back in July of last year, the National Abortion Federation filed a lawsuit against the Center for Medical Progress after the CMP released a number of “sting” videos that reportedly showed some underhanded dealings at Planned Parenthood. In September, the CMP — who boldly claimed they had nothing to hide and were being forthright — announced they would plead the fifth in the case. 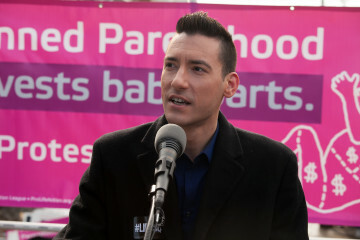 The judge told them that wasn’t happening, however, and now, fast forward a few months, we’re here, with the California Department of Justice ordering a raid on the Orange County home of David Daleidan, anti-choice activist and CMP head. Forced-birthers have met this news with the calm, rational, levelheadedness that it deserves, decrying it as “fascism” and the like. It’s a funny accusation given many of them are likely voting for Donald Trump. We fully support a thorough investigation into the activities perpetrated by David Daleiden and the Center for Medical Progress. As the evidence has shown in our case, he engaged in a long-running criminal conspiracy. His actions are not without consequences. David Daleiden’s lies are catching up with him. The only people who engaged in wrongdoing are the extremists who broke multiple laws to spread lies about Planned Parenthood — and it looks like they’re finally being held accountable. The office of California Attorney General Kamala Harris (D) didn’t offer a comment on the ongoing investigation, although as the Washington Post notes, the raid confirms that California is among states looking into possible criminal activity associated with Daleiden and the CMP. Which is going to be rather difficult given that fraud is among the crimes he might be charged with.